Ready to give your space an update with a fresh new paint color? 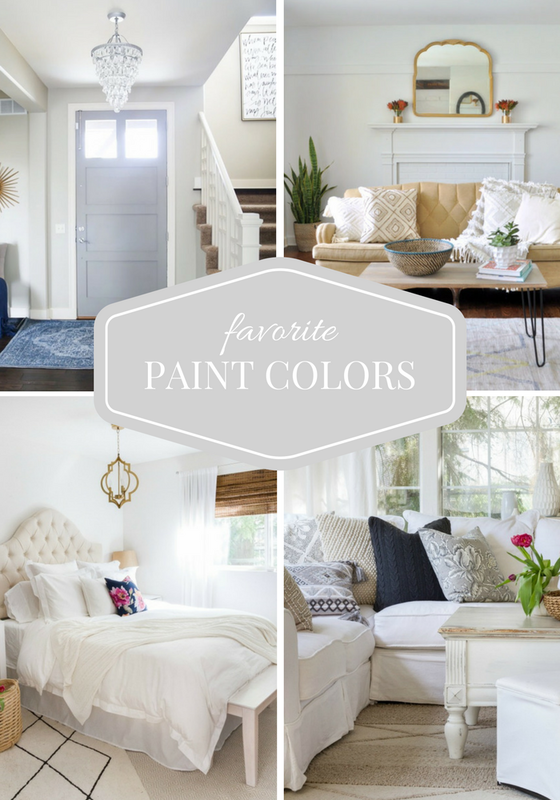 Get inspired by these top paint color selections from some of your favorite home bloggers. 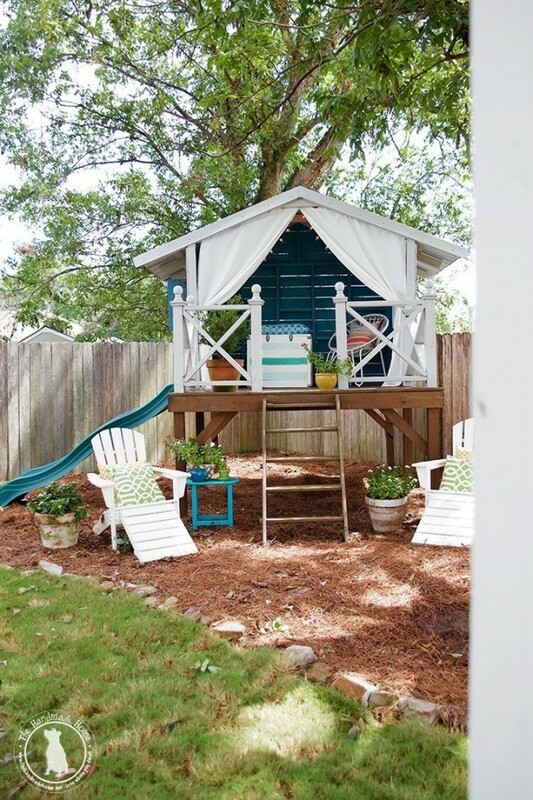 Did you love the paint colors shared in yesterday’s post? 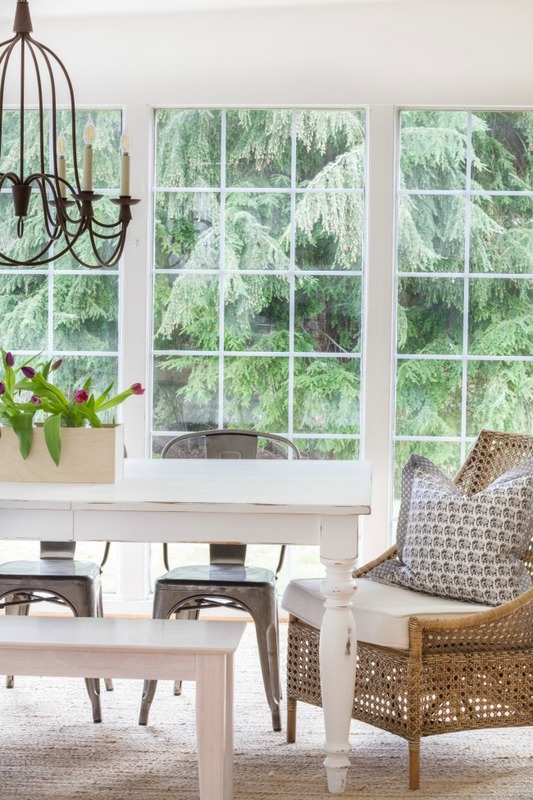 Kate, Abby and Danielle definitely know how to create wow-worthy spaces! 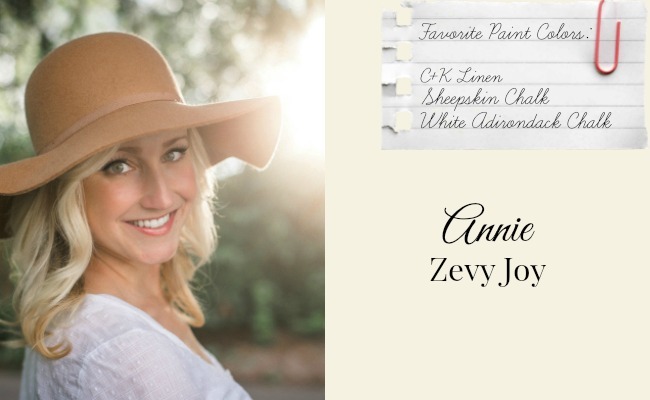 Hi, I’m Annie from Zevy Joy and I am thrilled to be joining you here as I share some of our favorite paint colors. Thanks so much Shauna for having me! I am a wife and mama decorating and cooking with some DIY in there too. I enjoy sharing our story one project and room at a time, and I hope you will come and say hello. White Adirondack by Folk Art Home Decor Chalk– This is my favorite chalk paint color on a budget! I have used this on several pieces of furniture in our home and I keep it on hand for little projects too. I love the bright crispness of this white paint and how it really pops. 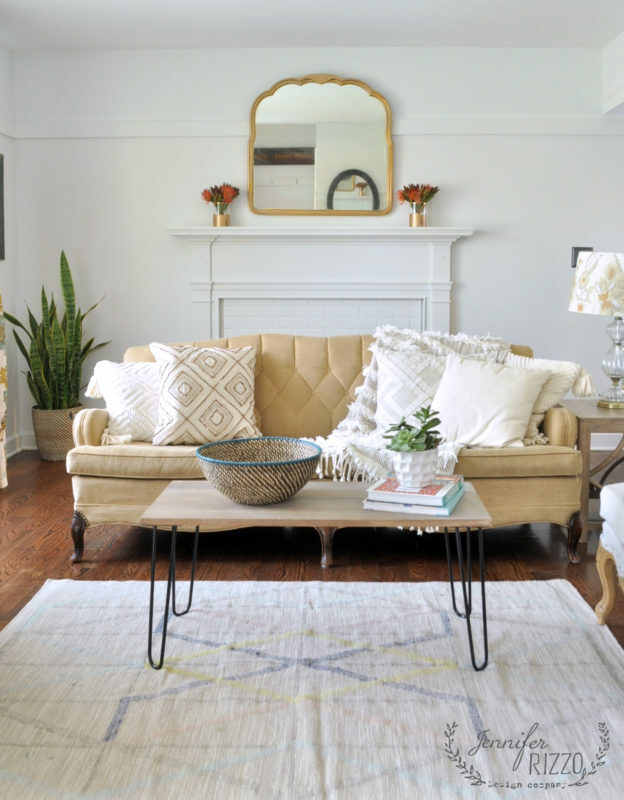 It gives furniture a clean look and wipes up wonderful when the kiddos make a spill. Can you believe we have used this on our dining table here and it has held up really well – even with those usual spaghetti dinners?! I finished if off with the same brand varnish and so far still good almost 3 years later. It is no fuss and easy to use as well, always a bonus – the tutorial can be found here! Sheepskin by Folk Art Decor Chalk– This is another chalk paint similar to the one above that I have enjoyed using throughout our home and for many craft projects. 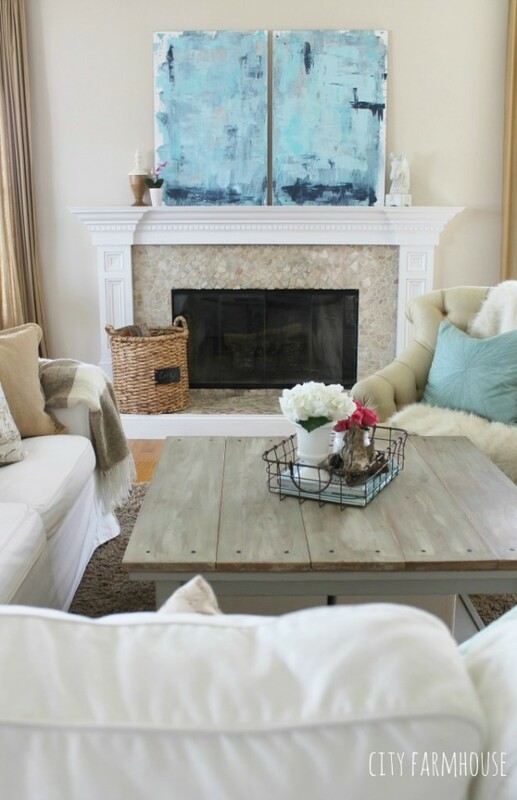 Although, this time it is a much more off white color and as you can see with my coffee table down below, I created a weathered look by combining the two (and blended it with some mocha brown here and there). It gave the top of the table a milky/gray wash. You can find the entire tutorial here. Linen by Clark and Kensington at Ace Hardware– If you have followed along with me for a little bit (which I appreciate so very much!) 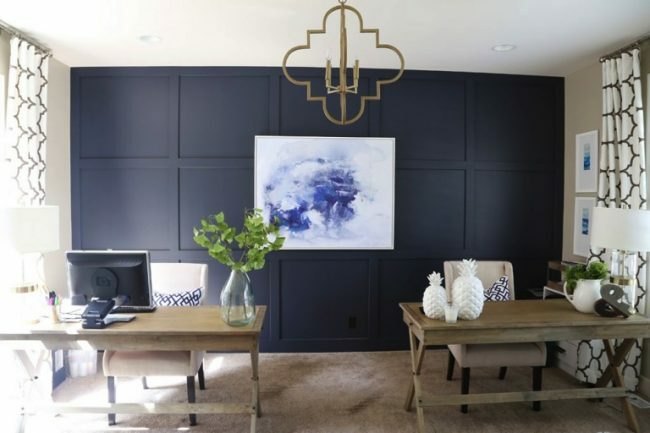 and if you haven’t, you will quickly notice that I love neutrals and almost every single wall in my home is white – unless it has wallpaper or a weathered wood finish ;)… So my “go to” wall paint color has been Linen. 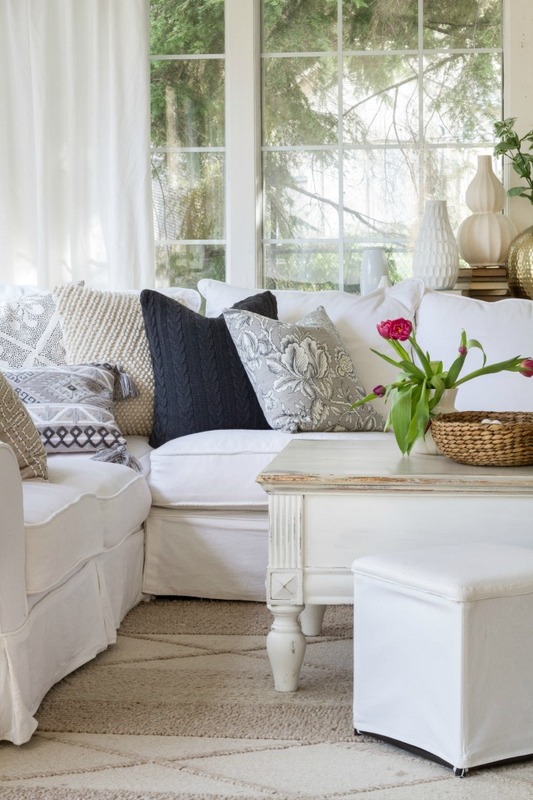 I have really enjoyed the softness of this creamy color and how it looks when paired with my bright white pieces or even dark pieces in our home. It has been the perfect off white for mixing tones. It is an affordable paint option that we have been happy with for a while now. Maybe one day I will venture out with a different color but for now, this suits me just right! You can see more of the walls in our home painted this color in my most recent Spring Home Tour here. Hi everyone! 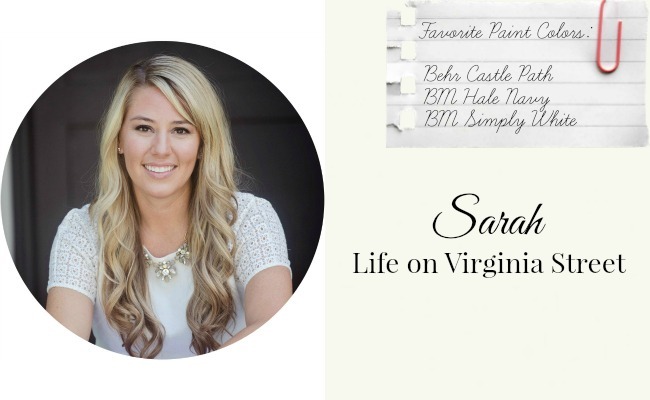 I’m Sarah from Life on Virginia Street. I am excited to be here today! I am a paint color freak and absolutely love the impact a fresh coat of paint can make in a room. It’s one of the most affordable ways to completely change the look of a space! It was hard to narrow down my picks but following are my three current favorites! 1 – Behr Castle Path. 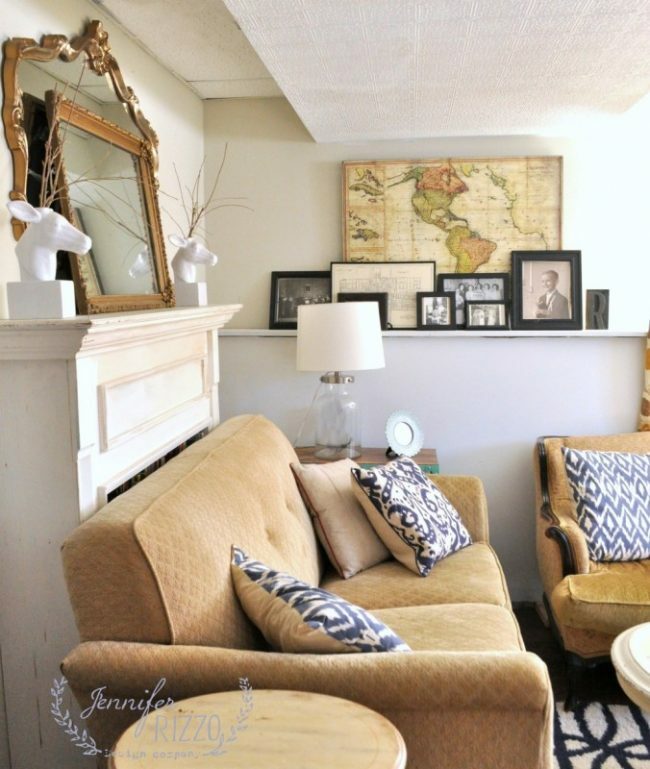 This is one of my favorite neutrals that changes with the lighting in the room. It is a warm greige tone with slight green undertones. I love that it can work well with cool or warm color palettes. We have this color in most of our home and it’s still a favorite! 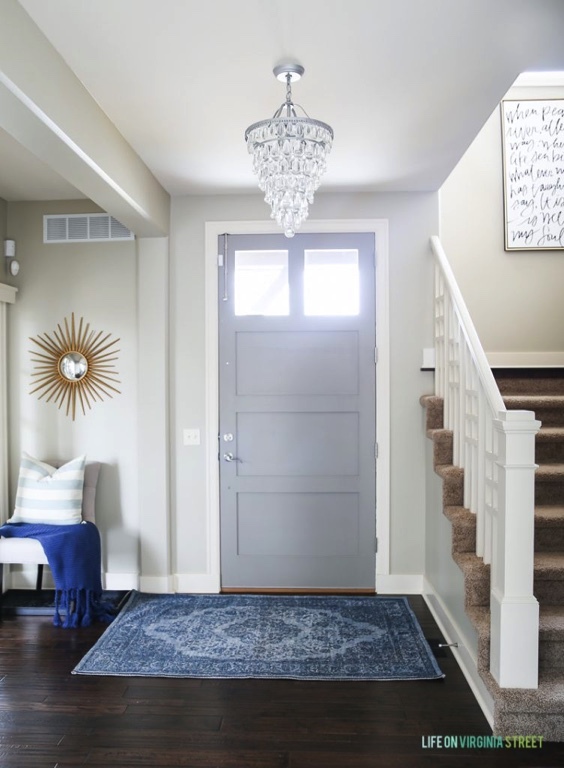 Our entryway hallway is my favorite use of this color, but in most homes, this color is going to appear darker (we have a lot of natural light right here). You can see more of this space here. The door color is Behr Elephant Skin. 2 – Benjamin Moore Hale Navy. This is my latest obsession. I recently painted my home office and our powder bathroom cabinets this color and I want to take it many other places in our home! The side walls in this room are actually Behr Castle Path. 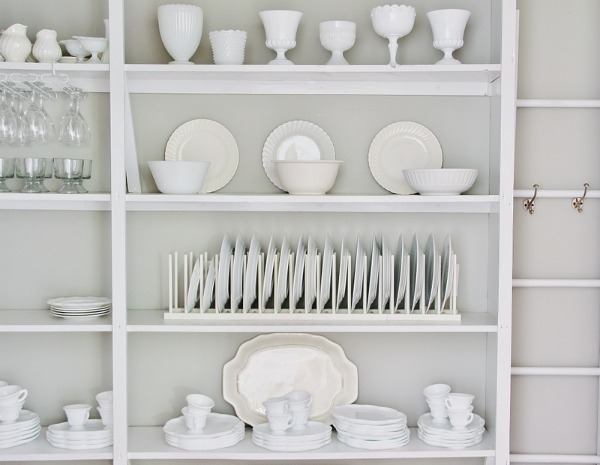 3 – Benjamin Moore Simply White. This wasn’t named 2016 color of the year for no reason. It is the best white paint I’ve ever found because it isn’t stark but still looks really white. I recently used it in my craft room/TV room makeover. Thank you so much for having me Shauna! HI everyone! My name is Jennifer Rizzo from JenniferRizzo.com. 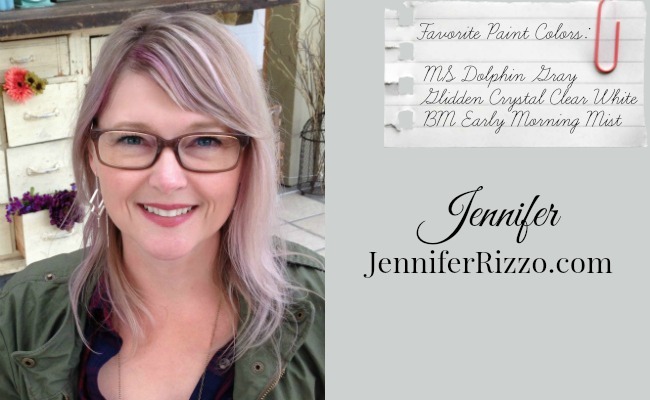 I am excited to share some of my favorite paint colors with you! My husband swears our home is 4 inches smaller from all of the paint on the walls and it’s actually holding up the roof. Is it bad when paint becomes structural? I used to be a very dark paint person, but every time I paint, it gets lighter and lighter. 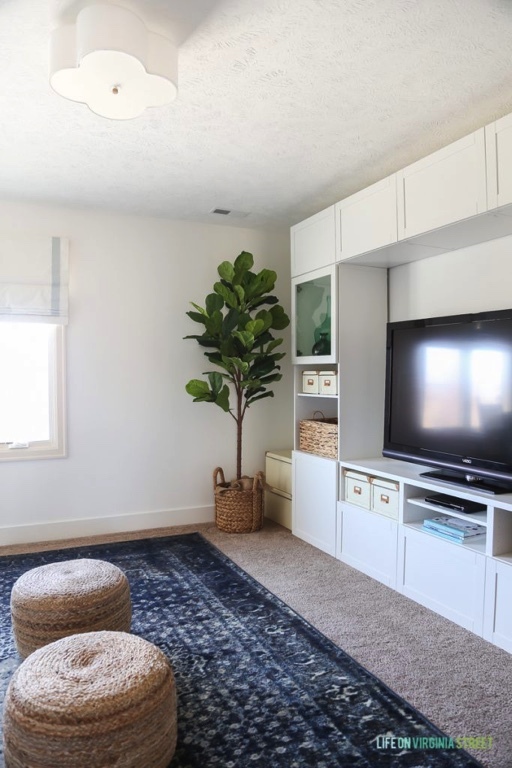 Recently, we painted out living room Crystal Clear White by Glidden, and I love how bright it is! It’s a crisp white with a slightly gray undertone. As a white it’s right there with Simply White by Benjamin Moore, as I recently repainted my cabinets for a refresh after 6 years. 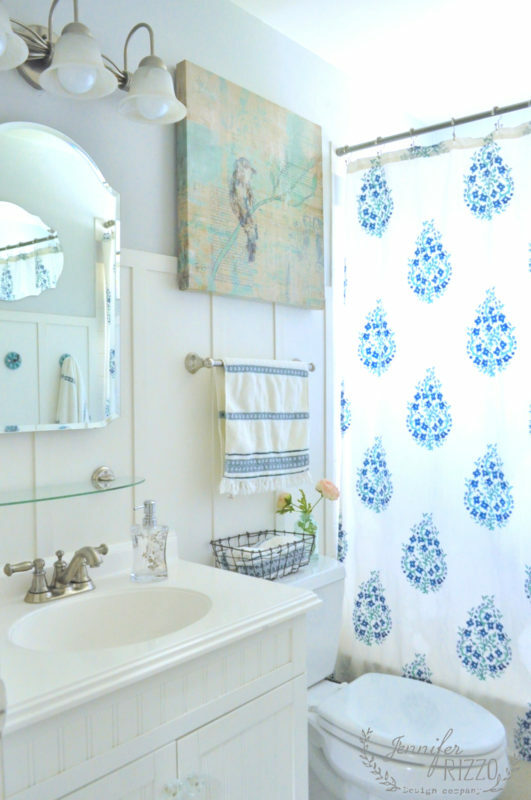 My second favorite color is our upstairs bathroom Dolphin Gray by Martha Stewart, and I still get asked all of the time what it is, it’s a great bathroom color! And my third favorite paint color is another Benjamin Moore color, Early Morning Mist. It’s a warm gray that is perfect for our downstairs basement family room. And Winter Orchard by Benjamin Moore. Thank you so much for reading and letting me share my room colors with you! And thank you Shauna for including me! Happy painting! Pin these Paint Color Selections for Later! So, that’s it for today. Thanks for stopping by to check out this beautiful paint color inspiration! I really love that color of the entryway of your home. I’m not really fond of light tones like that. However, it complements the interior of your house nicely. If I wasn’t focused on trying to pick a color for the exterior of my home, I’d probably start talking to my husband about getting the interior painted that color. I have a question. We are remodeling a 1,025 sq ft condo built in the 80’s. Installing new white kitchen cabinets, new flooring and painting all wall and ceiling. Doors are all hollow core doors and stained trim. Should I paint trim white and leave doors stained? Thanks. Is it the office you’re asking about? If so, it’s Hale Navy by Benjamin Moore.